Pomegranate oil.......pomegranates are one of nature's superfoods and not only are the well known health benefits super amazing, but the beautiful ruby red seeds taste super delicious too - it is one of my favourite fruits. So it will probably come as no surprise that the oil, which is cold pressed from the seeds, is packed full of health benefits too.......especially for your skin. Just like the fruit, the oil has a high content of antioxidants which fight off free radicals which helps keep your skin looking radiant and young.......so pomegranate seed oil is often included in anti-ageing lotions and potions. I love this magical oil and I try to include it in all my facial serums and creams. It penetrates the skin easily and deeply and is very hydrating and moisturising. It makes my skin feel firmer and seems to improve the texture...... and I just love the idea of putting a superfood on my face. It is a good oil to use for sports and therapeutic massage. Its anti-inflammatory properties help reduce inflammation and generally ease aches and pains........great for treating my yoga retreat clients who often have aching muscles in the middle of the week! A yellowish golden colour with medium viscosity and a unique nutty almost musky aroma. It has anti-microbial, anti-inflammatory and healing properties which make it fantastic for skin health. It is rich in vitamins A, B, C and E - great for elasticity, fighting wrinkles and keeping the youthful look. The oil contains punicic acid which is also known as omega 5. This gives it strong anti-inflammatory and anti-oxidant properties. Punicic acid can also help with reducing redness of the skin. Its soothing, hydrating properties help provide relief from eczema, psoriasis and sunburn. This oil provides fabulous hair health properties and is good for all hair types. Can help with reducing arthritis and joint pain. Rich in antioxidants and polyphenols, pomegranate seed oil provides natural protection for the skin from UV and free-radical damage. Helps with fighting bacterial infections. ﻿It can be used on its own as a simple and effective facial serum. Put a couple of drops onto your fingertips and massage gently onto your face before moisturising. To treat skin complaints such as eczema and psoriasis, or dry flaky skin apply this oil topically on the affected area several times a day. Use as a hair serum. Apply a few drops to slightly damp hair, leave to dry and enjoy your lovely shiny hair! Because it is a light and easily absorbed oil it is great for the area under your eyes. Gently smooth some oil under your eyes with a cotton wool pad (be careful not to get it in your eyes) every night before going to bed. 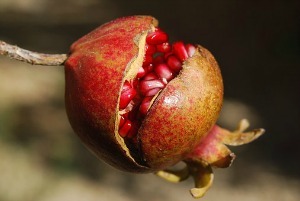 It takes a lot of seeds to make pomegranate oil, so it is expensive. It has a shelf-life of about 12 months.